The news was announced recently, after the signing of an agreement between the Indian ambassador in Mexico and the president of the fair. India will be the guest of honor at the International Guadalajara Book Fair, Mexico, in 2019. The great encounter of international literature will be an excellent opportunity to bring to the Latin American continent all the cultural and literary wealth of the Asian country. The Ambassador of India in Mexico, Muktesh Pardeshi, and the President of the FIL, Raúl Padilla, signed this week the agreement that subscribes to India as the first country in the Asian continent to be the guest of honor of this literary event, considered the largest in Hispanic letters. The Mexican representative said at a press conference that for the fair it is a great pride that India has accepted to be an honored guest next year, and said it will be an ideal occasion to establish bridges between the cultural industries of both countries. The president highlighted the richness and diversity of Indian literature, as well as its literary industry, which ranks among the most important in the world, with an annual production of 120,000 titles in 24 languages and an export to 120 countries. The figure of the Mexican writer Octavio Paz was remembered during the meeting, not only for being the winner of the 1990 Nobel Prize in Literature, but also for having served as Mexico's ambassador to India for several years. Padilla recalled Cortazar's words about India, when he described it as 'a place where the most modern modernity coincides with millennial cultural vestiges'. And is that the renowned writer Paz, who died in 1998, was a lover of literature "of that country, and thanks to that, many readers in Mexico knew the work of Indian authors such as the novelist Ruth Jhabvala, the poet Rabindranath Tagore, Also worthy of the Nobel and the short story writer Lokenath Bhattacharya. The Indian ambassador also pointed out that the idea that the country was an honorary guest of the IDF emerged two years ago in a meeting with the director of the event, Marisol Schulz, and described the fact as evidence that in recent years the relationship between the Asian and Latin American countries have been in progress, both in the political, commercial and cultural spheres. In fact, at present, India is not only a power in the edition of literary volumes, but also in those related to science and technology. 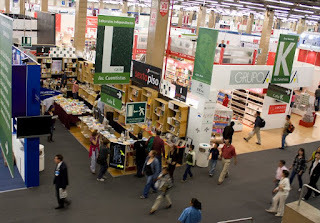 Annually, the International Book Fair of Guadalajara has more than 800,000 visitors annually, and brings together more than 20,000 book professionals and 800 writers from around the world. The next edition will be held from November 24 to December 2 of this year, in the capital of the state of Jalisco, with Portugal as the guest of honor.